John Travolta is a legendary Award-winning actor and film producer; he is best known for appearing in movies like ‘Saturday Night Fever’ (1977), ‘Pulp Fiction’ (1994), ‘Face/Off’ (1997), ‘Swordfish’ (2001), and ‘Hairspray’ (2007). The Golden Globe Award winner is also a writer, singer, and dancer. Despite being raised a Roman Catholic, John joined the Church of Scientology in 1975. Read on to find out more about his family, net worth, and the gay rumors surrounding him. Travolta was born John Joseph Travolta, the youngest of six children to Helen Cecilia (nee Burke) and Salvatore Travolta on February 18, 1954, in Englewood, New Jersey. His father, an Italian American, was a tire salesman who previously played semi-professional American football while his mother, an Irish-American, was an actress and singer who later in life became a drama and English high school teacher. John Travolta attended Dwight Morrow High School. He dropped out in his junior year to pursue a career in acting having been inspired by his mother. He first moved to New York where he joined a touring company before moving to Los Angeles. It was in the West Coast that Travolta got his acting break. He first featured in the horror movie ‘Carrie’ (1976) before starring in the sitcom ‘Welcome Back, Kotter’ (1975–1979). Mr. Travolta is also a fine musician; he released the hit single “Let Her In” which peaked at number 10 on the Billboard Hot 100 list. Other notable movies in which he appeared in are ‘Grease’ (1978), ‘Urban Cowboy’ (1980), ‘Perfect’ (1985), ‘Look Who’s Talking’ (1989). From an acting and other related careers which has spanned over four decades, John Travolta has been able to amass a net worth estimated to be around $170 million. This puts him among the highest-earning stars in Hollywood. Thanks to his huge bank account, Travolta has lived a very luxurious life and has also indulged in some very expensive hobbies. He is a licensed private airplane pilot and owns four aircraft. Due to this, Travolta resides in what is described as a “fly-in” neighboorhood in Ocala, Florida. He installed two runways to his $4.9 million mansion in order to gain access from his doorstep to the sky. For more than a decade, John Travolta has had to deal with numerous rumors about him being gay with more than a handful of people coming out with different accounts and details of the Pulp Fiction star’s transgressions. Travolta has himself described the allegations as one of the troubles that come with being a celebrity. In 1991, Time magazine reported that Travolta was contemplating leaving the Church of Scientology because it wanted to publish the actors’ supposed confessions of being gay. In 2014, one of his former pilots, Douglas Gotterba, related that he had a six-year relationship with his boss in the 1980s. The story was corroborated by Travolta’s former secretary, Joan Edwards, who worked for him between 1978 to 1994. Edwards said the pilot had confided in her during the time the supposed affair was going on. Whether all the allegations of John Travolta being involved in homosexual relationships are true or not, we may never know until the actor comes out and owns it. 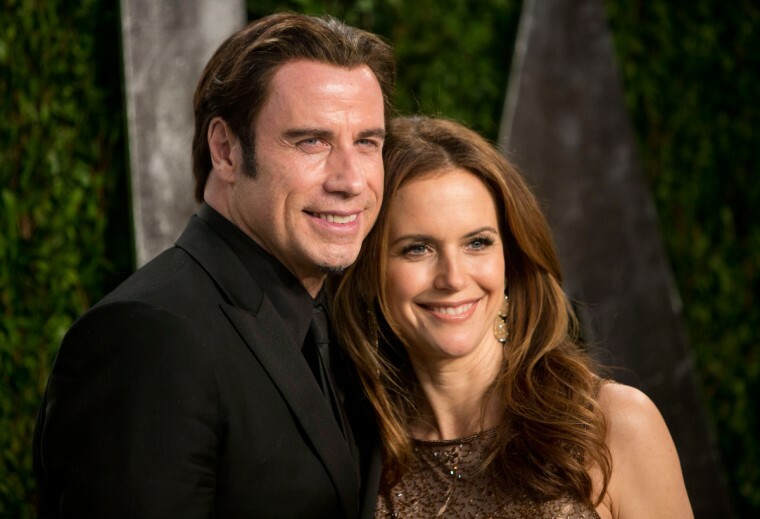 Despite all the gay rumors, John Travolta has managed to stay married to his wife, actress Kelly Preston who like her husband, is also a Scientologist. The two first met in 1987 while filming ‘The Experts’ (1989) before getting married in 1991. The couple had two ceremonies, one in France at the Hotel de Crillon on September 5 and then another in Daytona Beach, Florida on September 12, 1991. Together, the couple has three children; son Jett born in April 1992, daughter Ella Bleu born in 2000 and then another son Benjamin born in 2010. However, their eldest child, Jett, died from what was said to be a seizure on January 2, 2009, while the family was on holiday in The Bahamas. He was also autistic. Place of Birth: Englewood, New Jersey, U.S.